We put a lot of thought into what robots can do. But maybe we should pay a bit more attention to how the machines look and act. Madeline Gannon thinks so, anyway. She’s the artist/coder/designer behind Manus, an installation about how we can use body language to communicate with robots. In a recent interview with The Verge, she argues that the appearance and body language of robots could impact how we interact with the machines in the future — and help us stay safe in the process. 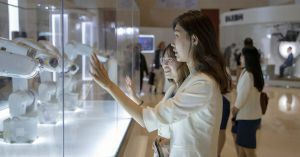 For Manus, Gannon programmed a row of 10 industrial robot arms to react to passersby at a World Economic Forum tech and science summit in Tianjin, China, in September. But the bots didn’t react as individual machines — Gannon connected them to a single controller, which essentially gave the bots a “pack mentality,” comparable to what you might see with dogs in the wild. In the Verge interview, Gannon suggests that thinking about robots as animals in general could help us develop better ways to communicate with them. To that end, Gannon suggests roboticists try to convey a robot’s intentions through its body language and appearance — the same way animals convey their intentions in the wild.